Cultural appropriation, according to this blog post. The interwebs are an ever-changing culture, and the blooming trends of today will have withered by next week. Nevertheless, the recent fad of Photoshopping “flower crowns” on popular figures from TV, film and other media has caught my eye. HOLD EVERYTHING! 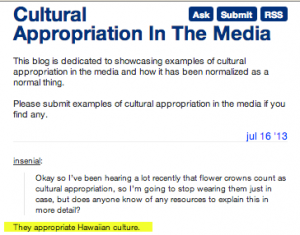 DON’T YOU REALIZE THAT “FLOWER CROWNS” ARE CULTURAL APPROPRIATION! THAT’S RIGHT. THIS BLOG RIGHT HERE SAYS SO. SEE? THEY’RE HAWAIIAN! 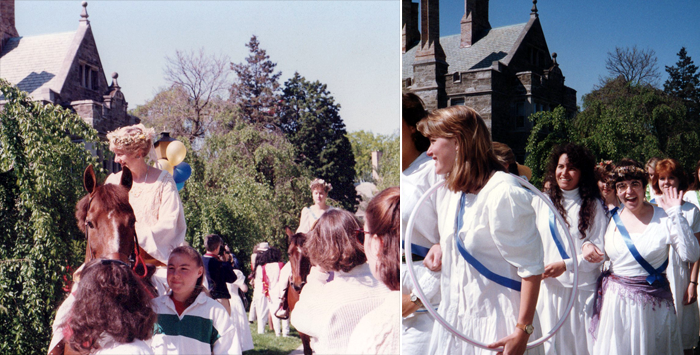 Do you mean to tell me that when students of Bryn Mawr College participate in our college’s one-hundred-year-plus May Day celebration, a fine old tradition imported (SEE!?! SEE?!!) 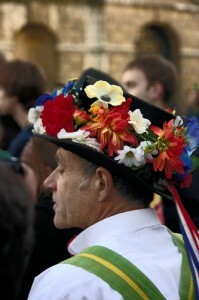 from England, those wreaths we wear are actually Hawaiian? — were they unwittingly borrowing a tradition from a far-away island? How about First Lady Mary Todd Lincoln? And the ancient Greeks and Romans, not to mention the Minoans? Antinoous, Roman emperor Hadrian’s boyfriend, photo by Marie-Lan Nguyen, CC. Amazing! I had no idea that the ancient Sumerian Queen Pu’abi and the slightly-less-ancient Assyrians buried at Nimrud were actually Hawaiian flower-crown wearers, despite predating the first human settlements in Hawaii by some 3000 years to 1500 years, respectively! It gets better. The kanzashi tradition of Japan, which dates back thousands of years, also predates Hawaii. In this case, different flowers are used at different times of the year, and may ward off evil spirits or celebrate love and the arrival of spring (which is roughly the meaning of medieval May Day crowns). 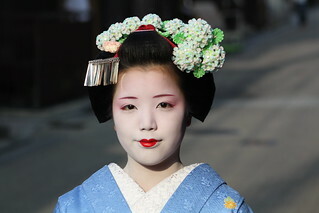 Kanzashi, photographed by Joe Baz, Creative Commons License. Sure enough, she’s the goddess of love, spring and flowers: the maiden-archetype is often associated with flowers and flower-wearing. —Asha, who cites a 1945 photo of her Yugoslavian grandmother wearing a flower crown for her wedding. However, that’s actually not the point I want to make. This Mythphile blog is about the intersection of mythology, psychology, and modern culture. When I see fans Photoshopping flower crowns onto images of their favorite fandom icons, I see an innocent echo of a very old tradition. Since ancient times, people around the world have worn flower crowns for communal ceremonies, sacred rites like weddings, festivals in which worshipers embody the May Queen or Xochiquetzal or Persephone. 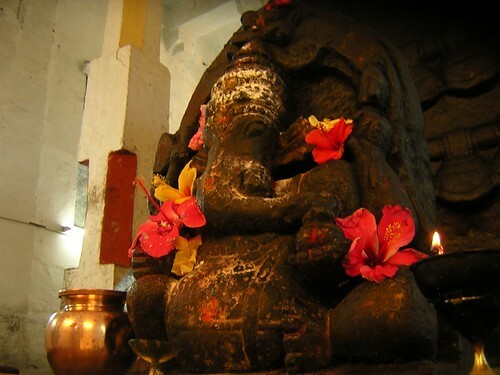 However, there’s another way in which garlands are used: to decorate sacred statues. I’m most familiar with this practice in Greek, Roman and Hindu traditions, but the more I look at traditions around the world, the more examples I see of cult objects being spruced up with garlands (sometimes as crowns, sometimes as collars). An image or statue is not alive. Yet it represents something alive, numinous. That’s why worshipers often gift their icons with that natural symbol of life, flowers. It’s both a gift of life and a way of imbuing an inert image with life-energy. Many modern mythographers have observed that with the breakdown of monocultures — self-contained societies united by shared myths, religions and customs that helped affirm and inspire their communal identity — modern people instinctively reach for stories in popular media from Star Wars to Spirited Away to provide meaningful symbols, stories and characters. The struggling folk hero rings true for us, even if it’s Harry Potter or Katniss Everdeen. No wonder fans feel the urge to crown their fan totems with virtual garlands. An age-old impulse has reappeared in a playful, digital form. The impulse to use flowers may go back even further. A Neanderthal burial in Shanidar Cave in Iraq has a thick layer of pollen beneath at least one of the skeletons. Some researchers have suggested that the many flower heads could have been brought in by a small animal. If so, it was very choosy, as five of the six flower types are used medicinally. I personally think it is just as likely that the flowers are there to honor the dead, not exactly a flower crown but similar in meaning.